Hey guys! 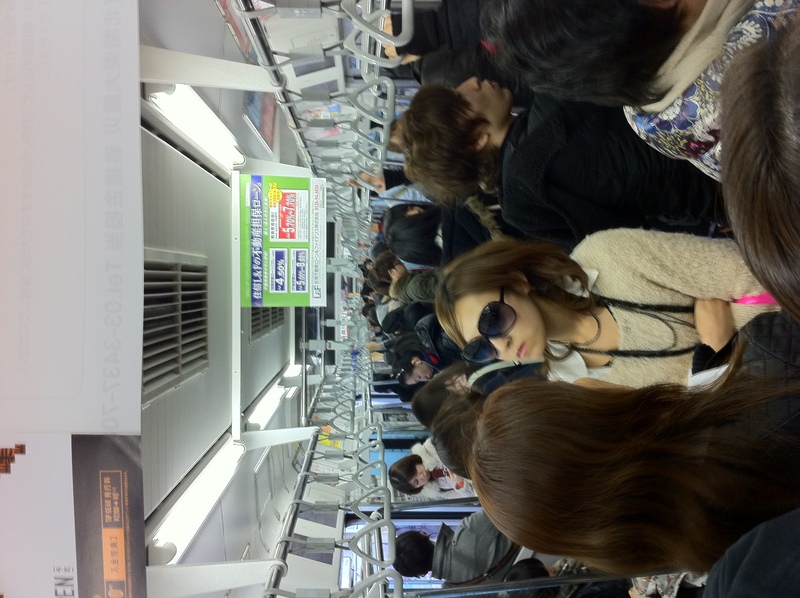 Here’s a shot from the Yamanote Line on Sunday afternoon around 5, passing through Harajuku. Tokyo seems to be mostly back to normal, though there are a few tell tale signs of recent events. Many buildings are conserving power, leaving some shops and malls dim and a bit spooky romantic. Also, it’s impossible to have a conversation with anyone about anything without talking about the Earthquake and sharing stories. My disaster-related vocabulary has improved by leaps and bounds lately, though my vocab list is a bit depressing! So things are slowly getting back to normal, and while it will take a long time for Japan to heal (especially in Miyagi and Iwate) life does, indeed, go on. It was good to see people out and about and get out ourselves a bit in Tokyo this weekend! I have lots to post about, but a big deadline is looming on a Japanese project, so I might not get a chance in the next couple days. In the mean time, check out the Japan Blog Matsuri! This entry was posted in Adventure!, Japan, Photos! and tagged Earthquake, life, normal, photo, picture, recovery, sunglasses, Tokyo, train, Yamanote. Bookmark the permalink. 10 Responses to Tokyo is not deserted! You just read too fast 😛 I fixed it before your comment came through even! LOL, well then… I should delete my comment so nobody else sees it!! You work for Kit Kats?! As in Nestle Kit Kats?! Wow!!! いいな! Thanks for posting this. Good to hear that life is going on as (relatively) usual in Tokyo. Did you find any problems getting about in central Tokyo? I have this big trip planned soon (8 nights staying in Shinagawa after I leave Hamamatsu, then day-tripping from there) and, while I know I may have to change parts of my plans – Ibaraki, Tochigi – I’m hoping to go ahead with most of it. Did you have any trouble getting food or drink? I’ve heard such mixed stories that I don’t know what to believe! We didn’t have any trouble getting around IN central Tokyo, though the trains in our area are still a bit disrupted, so getting TO Tokyo we had to be quite careful with the timing. It might affect your day tripping, but otherwise should be fine. I didn’t notice any food or drink issues, other than a few options on menus not being available. It seems more of an issue up here in Gunma, actually. I think the thing about food or drink is that certain things are noticably missing, which is strange LOOKING, but not REALLY a big deal. When I ordered something that was supposed to have spinach, they just left the spinach off. And some stores have absolutely no instant noodles or bread, but other stores or markets are overflowing with fresh produce. So overall, I think things are still a little bit wonky, but no big actual problems that I could see!